One of the coolest things I saw last year was a video that featured a virtual ride-through of the a new type of hybrid wood roller coaster. 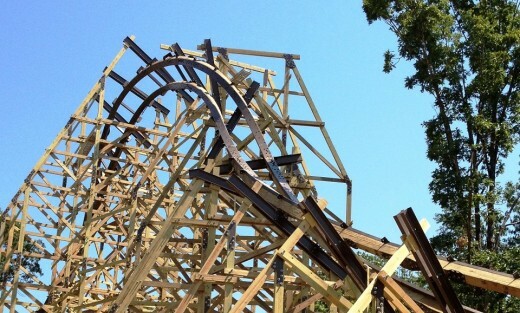 Branson, Missouri’s Silver Dollar City is building Outlaw Run, which will feature the feel of a wooden roller coaster, but all the pulse-raising thrills of a steel coaster. 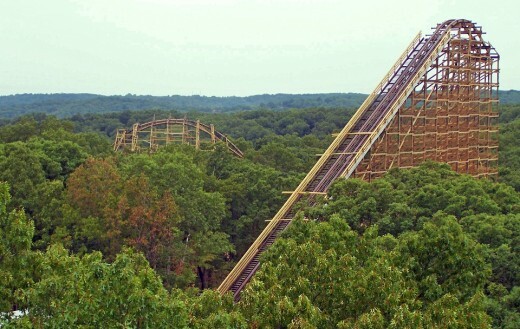 Silver Dollar City, highly awarded for theme development, designs attractions with compelling storylines to bring projects to life with real history in mind. In the creative concept, Outlaw Run goes beyond the outskirts of the safe haven of the 1880s Silver Dollar City to a storied place where civility is waning and outlaws may lurk. Passengers, setting out with brave new dreams of vast America, board the Western Missouri Stagecoach Company – where, during treacherous travel, and at any minute, a wild chase could ensue. “All generations will enjoy this bold and daring ride where the ‘good guys always win, leaving the bad guys in the dust,’” Thomas said. The new ride takes advantage of the natural mountain terrain, with a more than 10-story lift that leads to a 162-foot drop (16 stories) into a valley. Custom-designed “stagecoach” trains, fashioned after the iconic Concord stagecoaches of the time period, take riders on a journey of unexpected drops, thrilling twists and rolling inversions. Riders soar through nine locations where they will experience “airtime” – or weightlessness. I can’t wait to go for a ride, how about you?